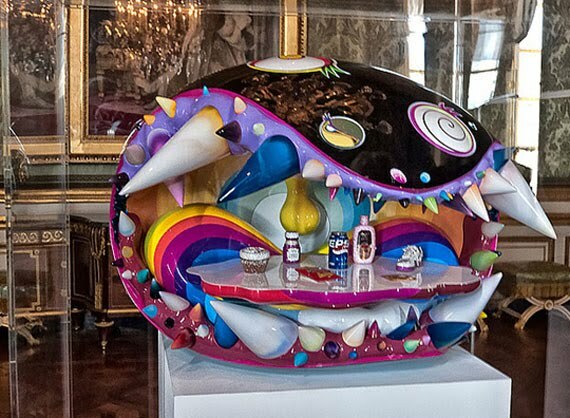 Currently on display at the Château de Versailles are the works of Japanese artist Takashi Murakami. Murakami has created a juxtaposition of of 17th century monarchy against contemporary modern Japan and it's quite controversial. Many tourists who have came to the palace for its history are unimpressed by the novelty juxtaposition. Others see it as whimsical and refreshing. The museum’s director is well aware of the controversy these exhibits provoke, but insists on drawing a line between debate and censorship. What do you think? 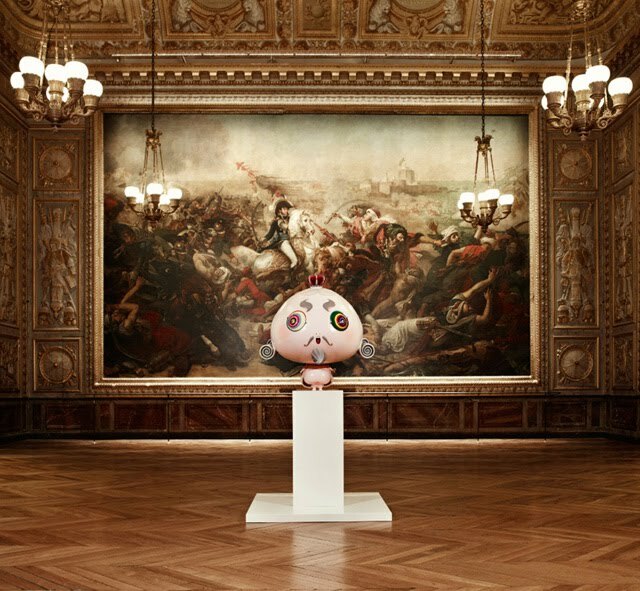 Do you like pop-art inhabiting the palace? 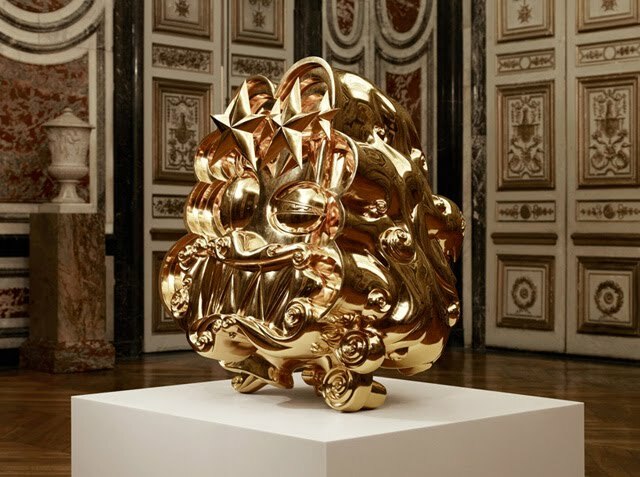 "Murakami Versailles" runs from now until December 12th and is part of the standard museum entrance fee. Hmmm...I'm a little torn here. Art is art and what an amazing place to showcase ones work. The juxtaposition is remarkable and I can see the art in it. I, however, am not a huge fan of this particular style of art. 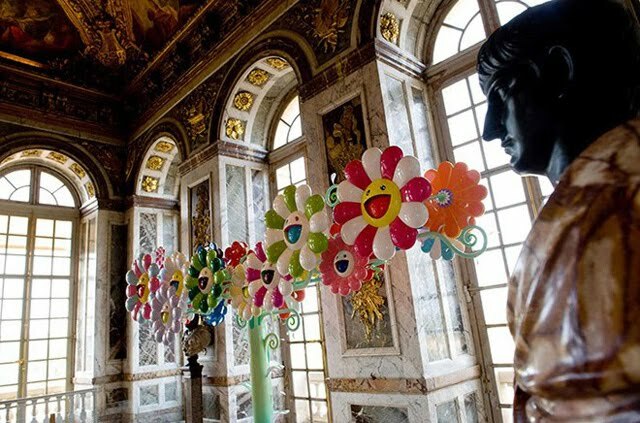 I remember the Jeff Koonz exhibit at Versailles had a similar impact and I'm a Koonz fan. If I went to see Versailles for the first time I might be a little dissapointed to find this exhibition. It does detract from the history of that gorgeous place. I agree. It's not permanent and the juxtaposition is quite eye-catching! no way...get the pop art out of there, it's ruining the whole thing!!! It makes both the art and the palace seem that much more than what they are. The pieces are sensitively chosen for the area that it is displayed in. Hooray for adventurous French design. Not a fan...it's a bit like placing a piece of anime over the Mona Lisa...another place I think. A few were okay...2, 3, 4, but over all...I'd much rather not be distracted from the palace itself. What would Louis think I wonder? I love love love it! I think of us....little, dancing & playing, running through the mirror of halls...The art is candy & bubblegum for us in the Big French Palace!! Now not later! I saw some of his outdoor installment art at 30Rock a few years ago. I always love the blending of contemporary art with traditional art and architecture. It's easy on the eyes. 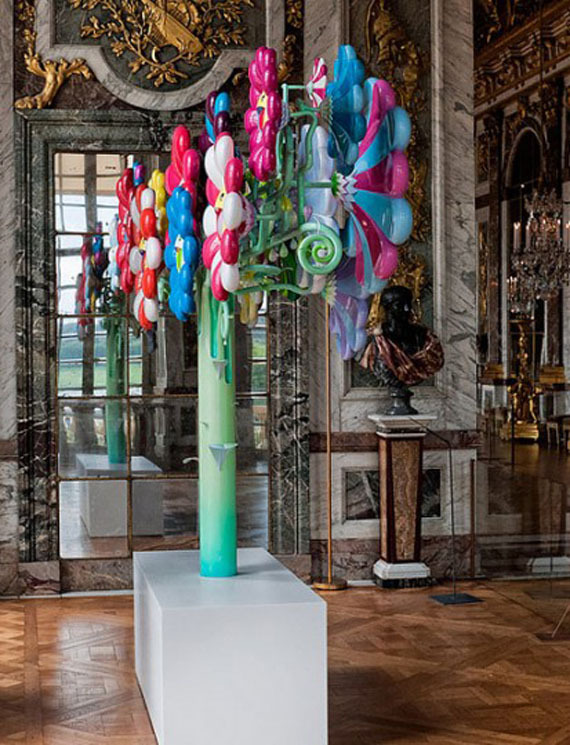 I saw a Jeff Koons exhibition in Versailles and I thought it was very interesting! I say NO WAY there is a time and place for everything. 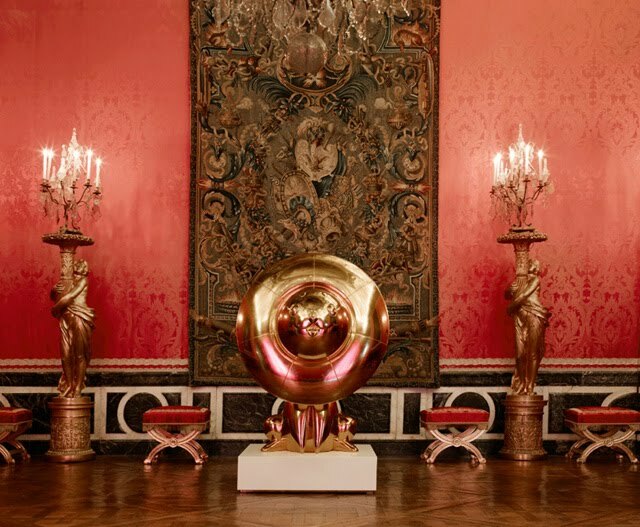 I want to see Versaille's history, not modern art distracting from it. 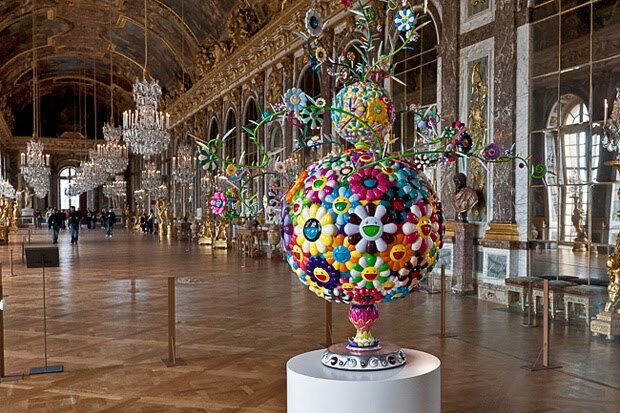 It breaks up the whole mood of one walking through and maybe trying to relive or see Versailles through the eyes of those who lived there, once one is all into it and really feeling it, they hit this large piece of eye popping colorful artwork! completely out of place. 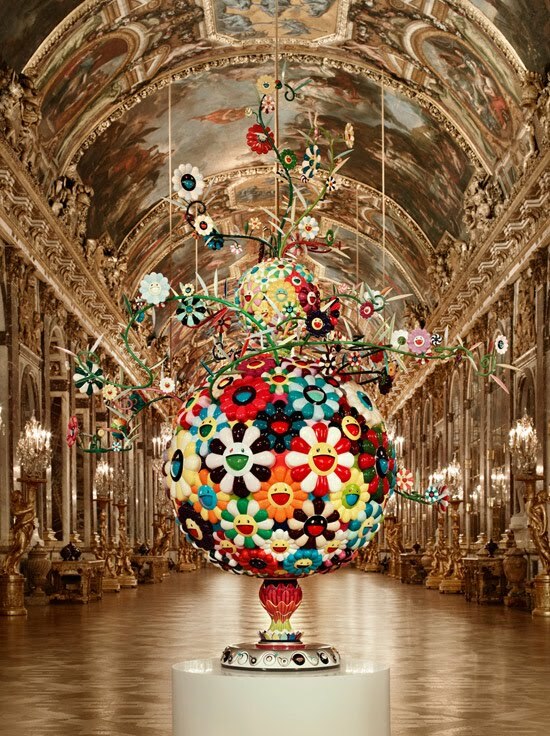 Interesting art work though, but not for Versailles. When I was there, they had an equally loud and contrasting Jeff Koonz exhibit and I hated it. I'm going to see Versailles, not pop art. It got in the way of seeing things I wanted to see and it was displayed so prominently. To me, it looks silly. 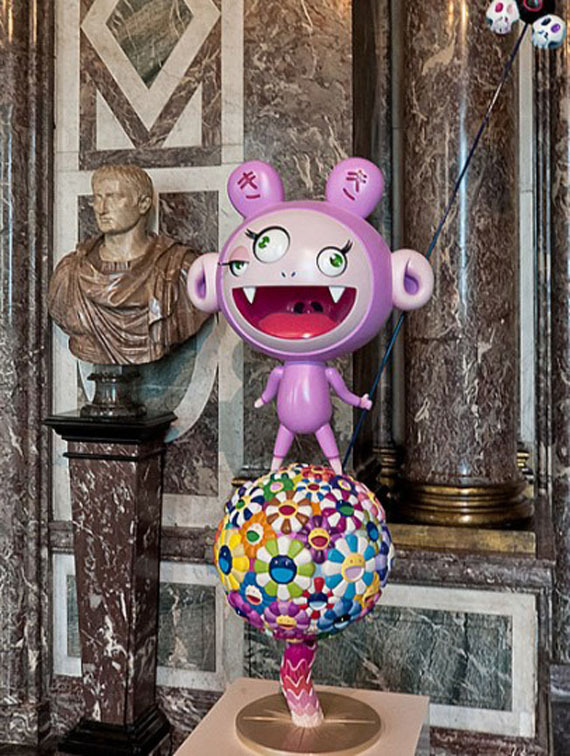 By the way: i love Versailles, and also Modern Art: but Modern Art museuns are just so boring, non?